A festive style for a holiday. Holly leaves, stems and berries adorn it abundantly. A holly crown encloses the main text of two names, and other holly leaves and berries drift about on this style. In the background is a pale, dotty pattern that quietly fades in and out, bringing depth and texture. The art is textured as well with a smudged, scratched effect giving the impression of a block printed piece. The main font is a bold, fancifully serifed outline style, and all of the supporting text is an ultra condensed typeface. Light spirited joy during the holidays is what this style expresses. 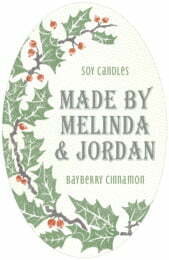 Customize your Holly Rustic labels today! Printed on your choice of coated paper or waterproof vinyl label stock, Evermine labels are peel-and-stick and come on sheets measuring 9" x 12". Depending on the size of the labels, there are between 6 and 60 labels on each sheet. All Evermine label stocks print with fine detail and rich color. They are writeable with a sharpie or marker. The vinyl labels will do just fine immersed in an ice bath or a refrigerator. The vinyl labels are also easy to reposition or remove from smooth surfaces such as glass, metal and plastic. 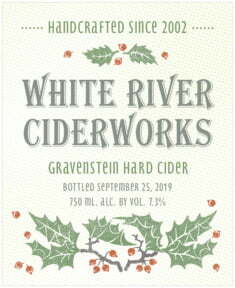 Make all your special events and products memorable with Evermine personalized Holly Rustic style labels. These labels are not guaranteed to withstand a trip through the dishwasher, or prolonged use around creams, oils or acids such as citrus oil, vinegar, fragrances, etc.